This morning Travelers Nine, Ten and Thirteen and I piled into a cab and headed to the airport in Guayaquil. Thankfully, Traveler Nine had been to the Galapagos Islands before and was able to seamlessly navigate us through all the extra security measures you go through, and all the paperwork you acquire, when you fly to the Galapagos. A very nice bottle of rum was acquired along the way as well I seem to remember. When flying to Galapagos Islands bring the following: $10 USD for the Galapagos Islands Transit Control Card, $100 USD in CASH for your entry fee to the National Park, collected when you land on the Galapagos, and a gas mask. Okay, maybe one of those little surgical masks will do. But why would you need to block access to your airways you ask? Because they are going to spray the overhead bins and all the luggage stowed with in them with a World Health Organization approved insecticide on approach to the islands (to prevent invasive species from entering the rather fragile ecosystems of the Galapagos). If you don't want to inhale massive amounts of neurotoxin wear the mask. Trying to shrink and disappear into your clothes and slide under your seat like I did doesn't work as an exposure preventative. The Galapagos Islands are located 600 miles west of the mainland of Ecuador in the Pacific Ocean. This volcanic archipelago, consisting of 120 islands and islets, straddles the Equator. Over 97% of the islands are a protected national park surrounded by 27,000 square miles of marine preserve. Air temperatures are generally in the 80s though water temperatures can be quite cool thanks to the Humboldt Current. The islands gained fame due to their extraordinary endemic species, studied by Charles Darwin while he was on board the HMS Beagle. Darwin's observations and study of collected specimens from the islands contributed to the development of his theory of evolution by natural selection. 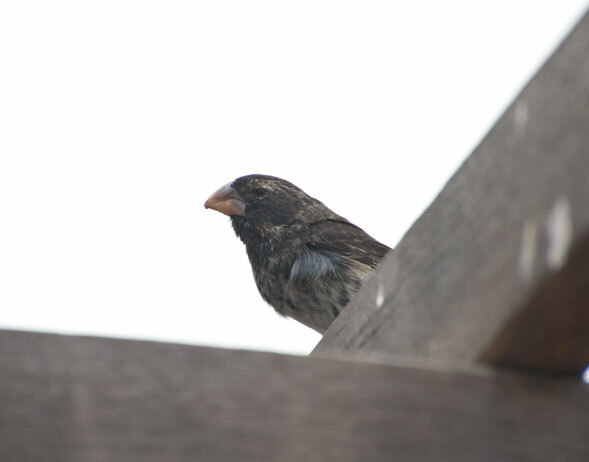 Darwin's finches, perhaps the most famous of the species he studied and wrote about, may be tanagers and not finches at all. We landed on the small island of Baltra in the middle of the Galapagos archipeligo. Baltra is flat, dry, and covered with prickly pear cactus. It is the very end of the dry season here in the Galapagos. Nothing green was to be found anywhere. 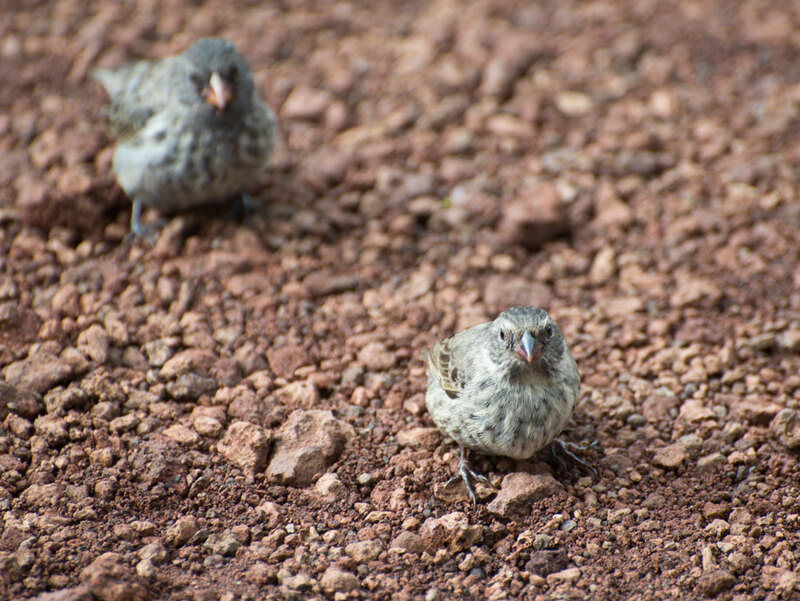 Small tree finches flitted through the dry salt bushes (my first Darwin's finches!). We were loaded onto a bus down a winding road to the shore where our luggage was thrown on top of a boat and we got in and sat below the roof (is it a roof on a boat???) where our luggage lay to be taken to nearby Santa Cruz island. 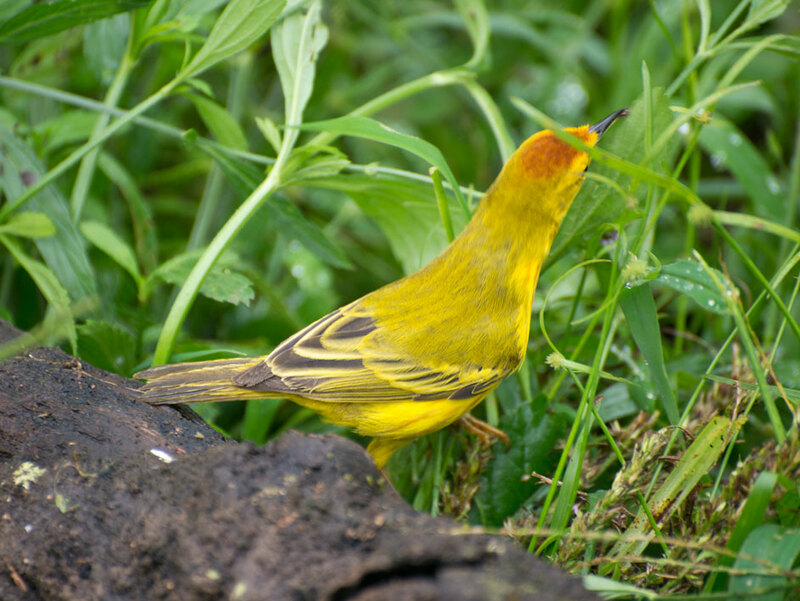 Immediately the wonders of the Galapagos began to reveal themselves. We saw a marine iguana and then masses of Great Frigatebirds, Magnificent Frigatebirds (who on the Galapagos may actually be a distinct species according to recent research), Brown Pelicans, Red-billed Tropicbirds, and the famous Blue-footed Boobies. 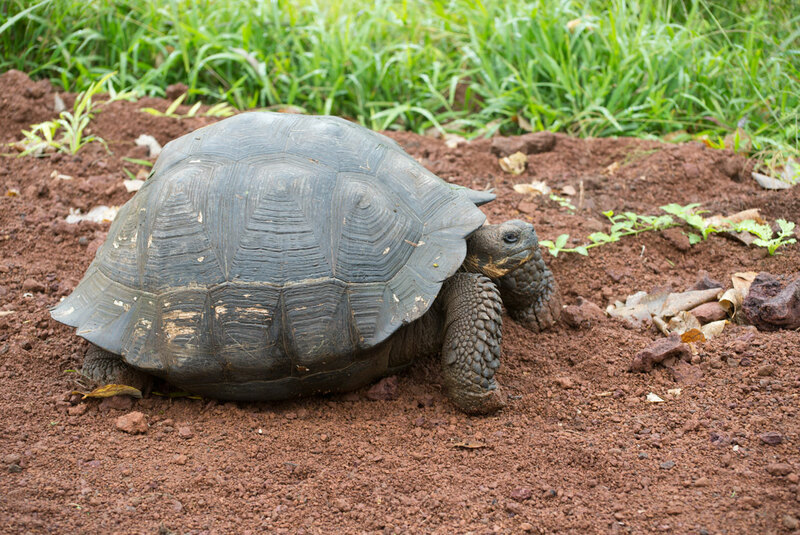 Santa Cruz is the second largest island in the Galapagos. It is the most populated. The island is a huge dormant volcano about 381 square miles in area and rising to a maximum altitude of 2835 feet. We climbed into a pick up truck and were taken up into the highlands on the straightest road I have ever seen. It transects the island it is so straight. As you rise in elevation the island turns from almost desert dry to green, lush, and dripping from the clouds caught on the heights..
We were first taken to the Twins, two huge craters formed by the collapse of magma chambers. From a geological and avian point of view these holes are pretty interesting, though compared to what we would see in days to come they weren't the most spectacular things to look at. We walked through wooded pathways lined with Scalesia trees (relatives of the sunflower no less! ), covered in mosses, lichens, and epiphytes, to look at the craters. I had Tolkien-like Mount Doom scenarios in my head thinking about the fiery formation of the island as I looked the collapsed magma chambers, imagining magma shifting and lava spilling and smoking its way down and down, while at the same time it built upon itself as it cooled in layers and layers forming the land we stood on. Allegedly, you can see vermillion flycatchers here but we didn't this day. We also didn't see a short-eared owl though we did see its nesting area in the side of one of the Twins. 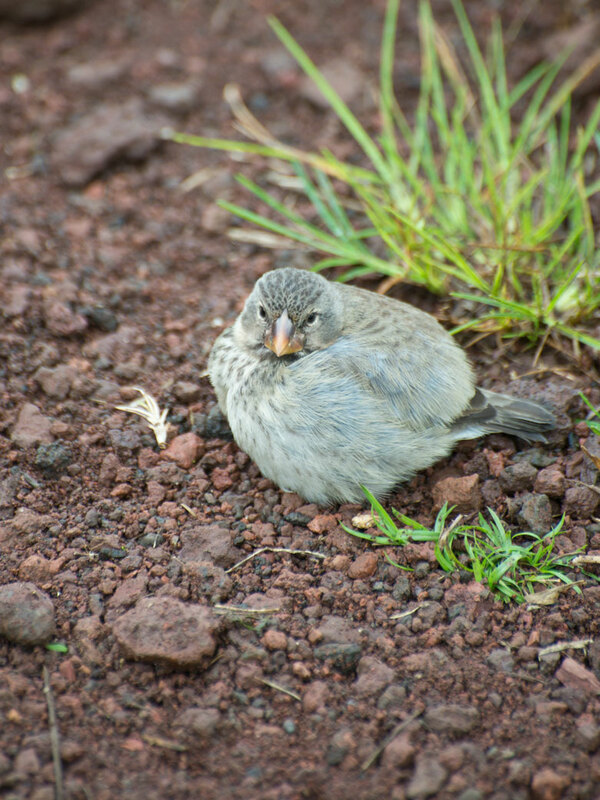 I did see my first glimpse of a Galapagos Mockingbird, though. Then it was back into the truck, our guide sitting in the truck bed giving directions to the driver, and we went down a muddy track toward the Giant Tortoise Reserve (El Chato). Along the way we saw lots of cows. There is active agriculture on this island. 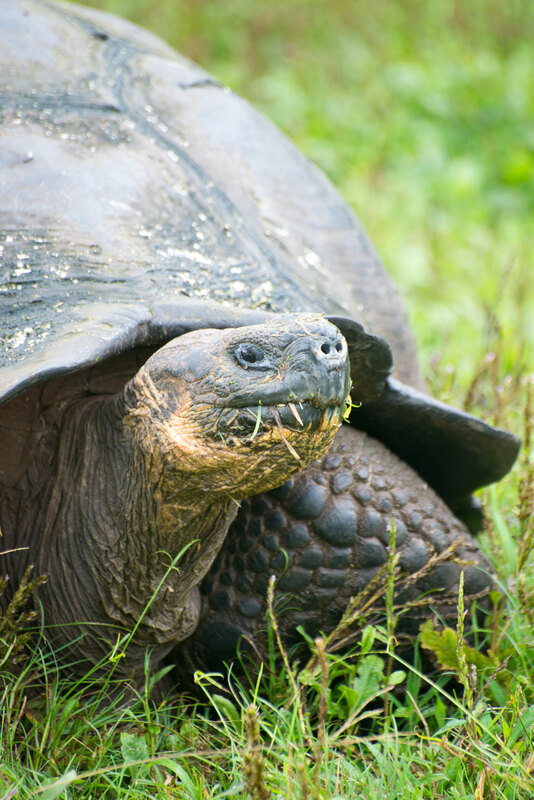 And in the fields were Giant Tortoises! We got a great look at a rather small one (maybe a foot and a half high at the top part of its domed shell) who was walking along side the road, though walking is perhaps too fast a description for how tortoises move. We arrived at the reserve. You have to wear rubber boots, which they provide. You get a lecture about Giant Tortoise biology and look at some skulls and shells of now departed tortioses. There is even one that, if you want, you can climb inside. We saw one fool do this who began doing push ups while "wearing" the shell. 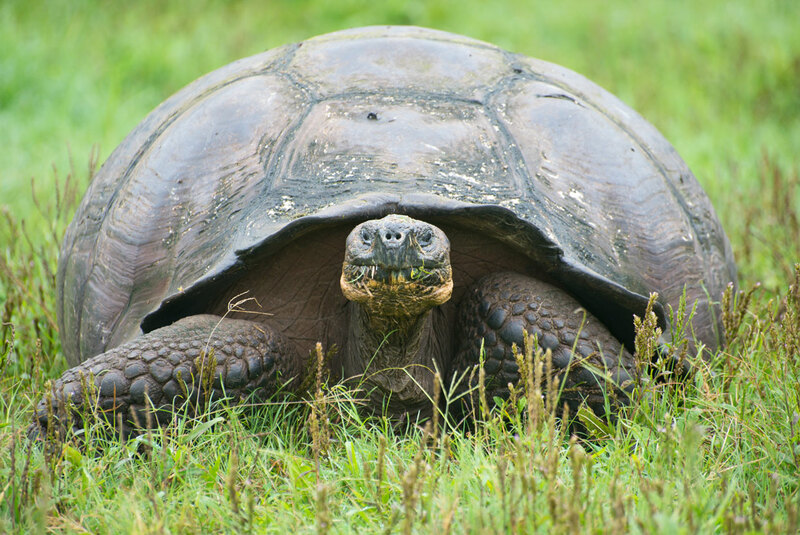 We also learned that it takes two hours for giant tortoises to mate. Once you get away from the touristy aspects of the entrance area be prepared for the incredible. We walked a short way into a field and approached a magnificent old tortoise who was the size of small car. He was happily eating away, ripping grass off in its mouth and slowly chewing, not terribly concerned about our presence. And us? We were changed by this encounter with this gentle being. We listened to him breath. Just breathing. This being who could easily be twice or three times our ages just breathing, being, and eating. We walked some more visiting individual tortoises, seeing where they had created sleeping accommodations for themselves by plowing into the bushes and making a tortoise shaped house over time. 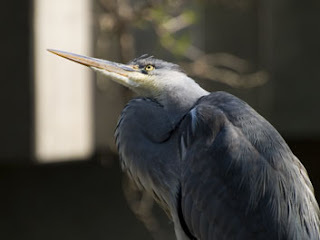 We saw them basking in water, in the sun, eating, and watched as yellow warblers landed on their backs. 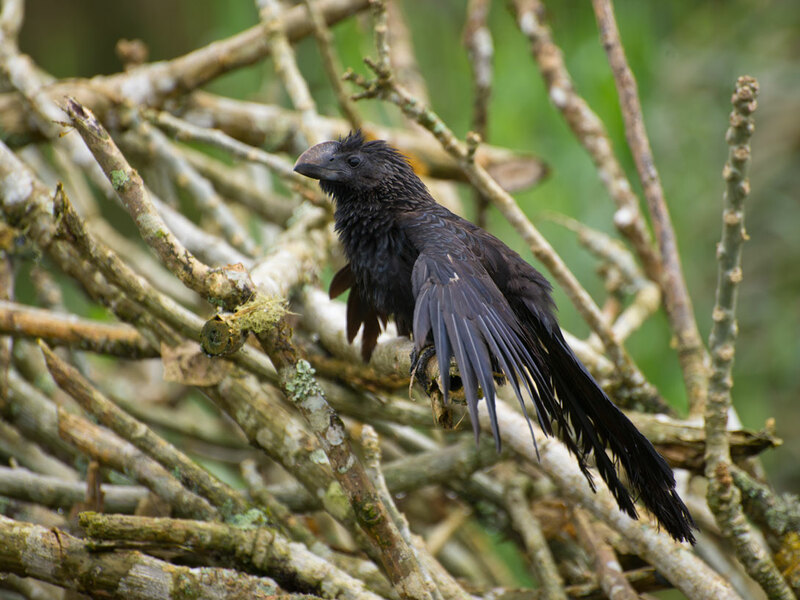 We passed by Smooth-billed Anis, with wings extended, drying off in the sun as it emerged through the clouds. 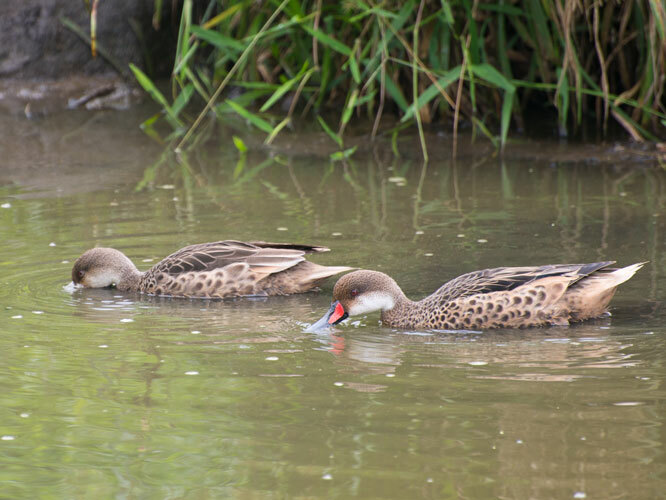 We watched White-cheeked Pintail Ducks paddle by creatures who's life spans outstrip most living animals' lives. We must seem so fleeting to them. Covered with mud and happy we reverted to Hobbit form and had afternoon tea, or more specifically coffee and empanadas. Then it was off to investigate a lava tube, a cave-like tunnel created from low-viscocity lava hardening above a still-flowing active lava stream. 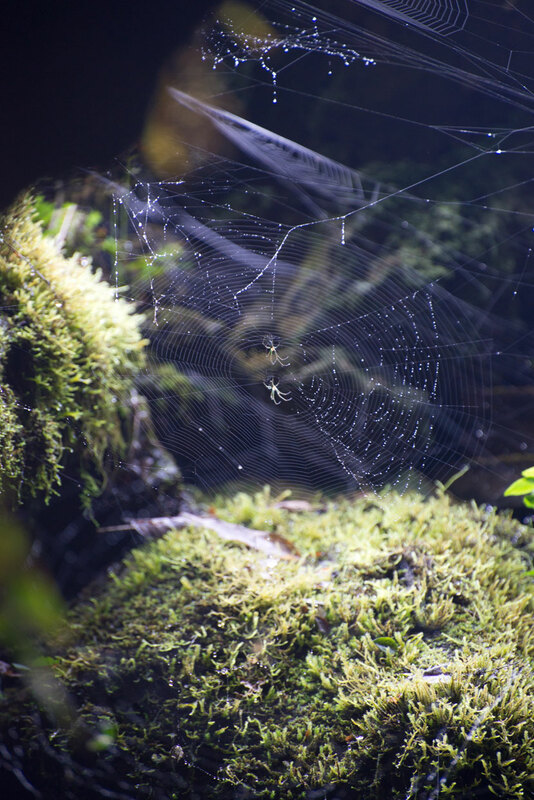 We admired the spider-webs lining the entrance and the multiple denizens therein. Okay, perhaps I admired the spiders. Some of my follow Travelers weren't so enamored with our eight-legged encounter. 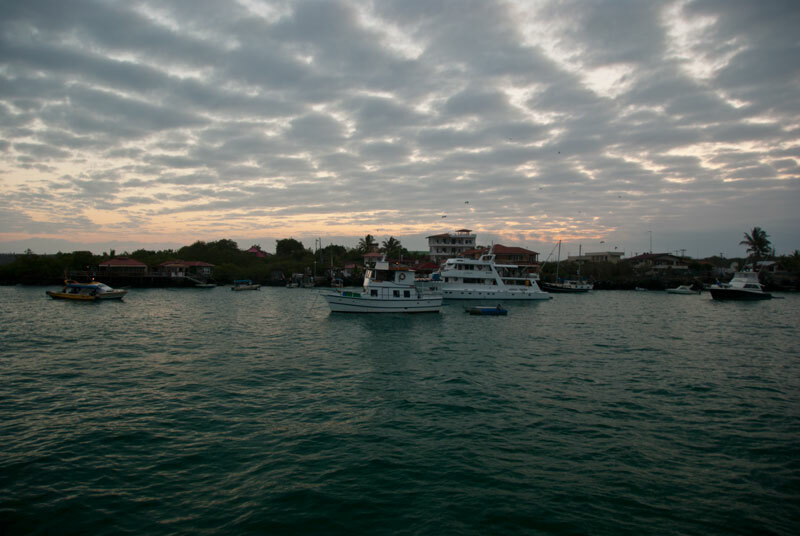 Then it was off to Puerto Ayora, the largest town on the island, and out to our boat. 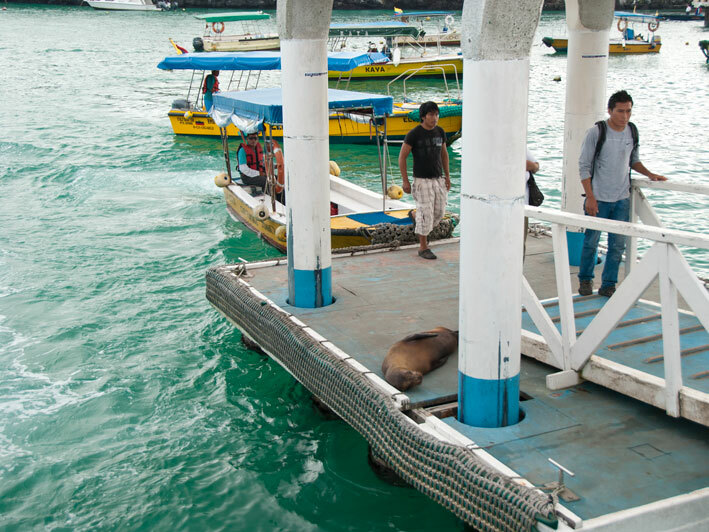 We stood on the pier waiting for transport out to the boat and met the real masters of the waterfront: the sea lions. 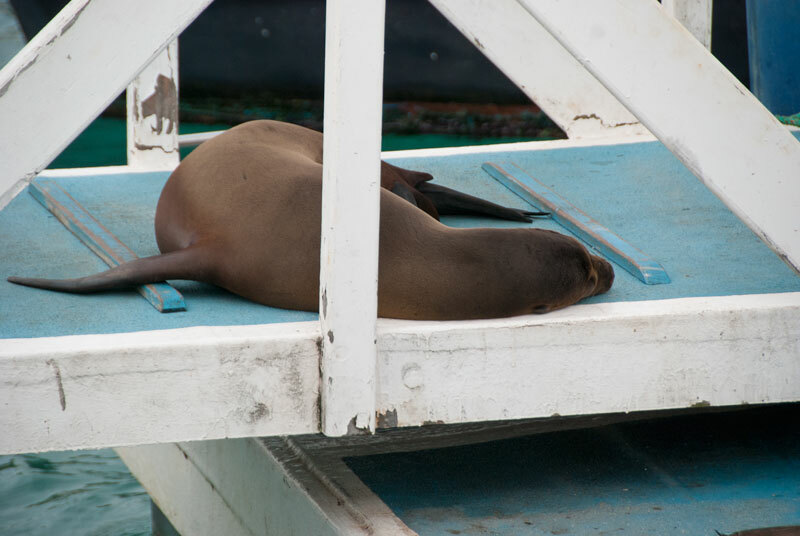 Sea Lions must be really pleased we went and built all these docks, park benches, and moored all these boats just so they can have place to sleep. Really, they are quite convinced we did it all for them. The ones ones on Pier 39 in San Francisco told me so. Our water taxi, the trusty panga, like a Zodiac, that we would get to know well in the following days, took us out to the Aida Maria, our home for the next three days. This was a fun ride, sitting on the edges of the panga and just skimming over the water. To disembark, the driver basically rams the panga's nose up against the aft end of the yacht, and you jump over the panga's nose onto the yacht, hopefully with the guidance of a strong helping hand. It would take me three days to get the hang of this. The Aida Maria is one of the very few in the Galapagos hand made from local timber. 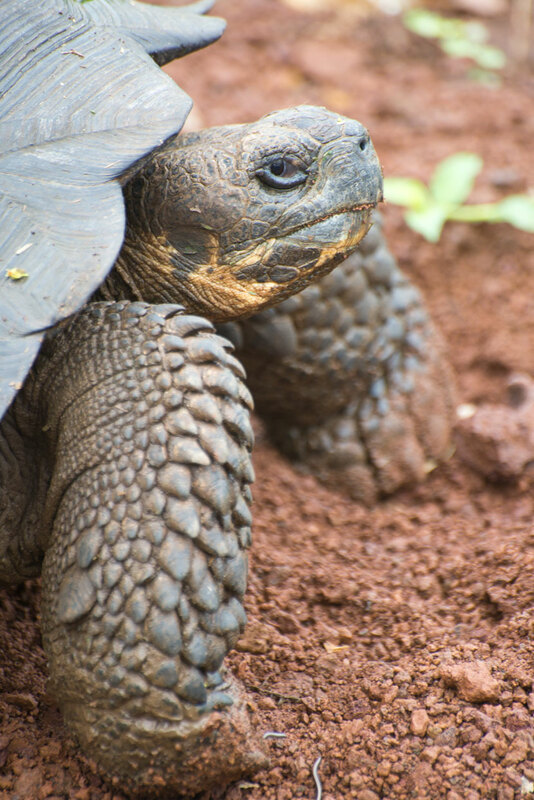 The owners have been running tours in the Galapagos since the 1960's. It is a family owned business with the family having roots in the Galapagos dating to the 1930's. The Aida Maria has eight cabins (with bunk beds) holding 16 passengers plus crew. The crew are fabulous. We had the two cabins on the topmost level. The views were stunning. The boat was rolling in the waves. Really rolling. The location of our cabins meant that we felt the yacht's movement the most. Upon arrival, Traveler Thirteen succumbed to a stomach virus and disappeared for the evening. Traveler Ten stuck a sea-sickness patch behind her ear and there may have been some dramamine taken as well. Traveler Nine wasn't bothered. And since this Traveler has dizzy spells anyway a seriously rocking boat wasn't any different than any other day. As Travelers Nine, Ten and I sat on the rear deck watching the sun go down we met our fellow passengers one by one as they returned from their tour of the Tortoise Reserve and the highlands. I watched squadrons of Frigatebirds and brown pelicans fly by. I also saw White-vented Storm Petrels for the first time. These little birds flit like swallows just above the waves and then look like they are almost dancing on water with their feet. 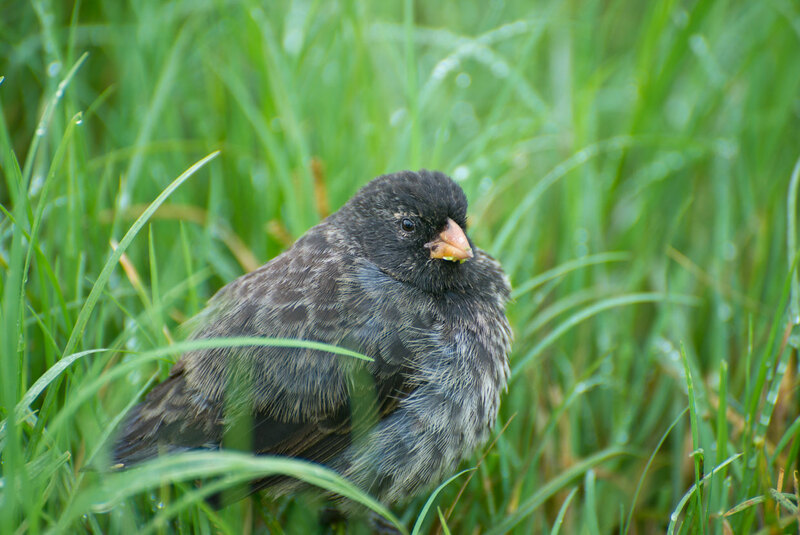 Though seen frequently in the Galapagos very little is known about this bird because only about a dozen nests have ever been found. Travelers Nine, Ten and I then descended the ladder to the main deck where we met our naturalist/guide, more of the crew, and joined the rest of our fellow travelers for dinner. The other passengers were in the middle of an eight day tour. They hailed from Canada, Florida, Switzerland, and New Zealand. Dinner was great. The food plentiful. But all non-Ecuadorians should still not eat the raw vegetables (as we saw our fellow passengers eating this we knew why they were all complaining about being ill). The evening slid into night and Nine, Ten and I took the bottle of rum out to the topmost bow deck and the rest is none of your business until...about 1 am in the morning when the boats engines came on and we began our journey to Floreana, the next island on our itinerary. When we entered open ocean every person on that boat knew it. I learned it IS possible to sleep while continually finding one's head or feet alternately at 45 degree angle off the horizontal at any given time.